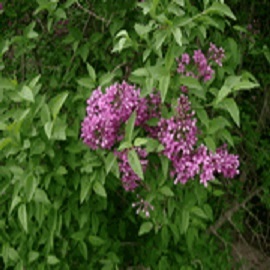 The Persian Lilac, Syringa x persica, is a spreading, graceful shrub with arching branches, reaching 4 to 8 feet in height, 5 to 10 feet spread. This deciduous shrub has dark green foliage. The pale lilac flowers are fragrant, late spring blooming, abundantly produced on 2 to 3 inch long panicles.